You probably rely on built-in redundancies in many aspects of your operation. Backup generators supply the electricity that keeps your business running in the event of a power failure. Your computer network is equipped with redundant systems to prevent interruptions that could bring your systems to a standstill. You may even cross-train members of your staff so that one worker can easily fill in for another during vacations and extended absences. If your business involves the manufacturing or distribution of chemicals and you depend on refrigeration units to keep them at the appropriate temperature, a malfunctioning refrigeration unit could have devastating consequences. A dual refrigeration unit gives you additional protection if one reefer unit fails. This can be critical for chemicals that are susceptible to spoilage if they’re not chilled. What Causes Refrigeration Units to Break Down? There are several reasons a refrigeration unit could fail. Neglecting to pre-cool a chemical prior to placing it inside the unit could cause it to work harder to maintain the desired temperature. The additional strain may eventually cause a breakdown. An improperly maintained reefer container could lead to excessive wear on the parts and eventually cause the unit to fail. A road accident could also disable the reefer, which could result in cargo spoilage. Even if you carry cargo insurance, it may not necessarily cover every potential cause of a breakdown and it won’t do much to satisfy an unhappy customer who has to deal with a late or spoiled shipment of the chemicals they need to manufacture their products. You can avoid the hassle altogether by utilizing one of our dual refrigerated containers from the start. A dual redundant refrigeration unit is highly recommended when transporting dangerous or temperature-sensitive cargo. A dual refrigeration system consists of a primary and back-up unit. While both are fully functioning reefers, the secondary unit only kicks in if the main unit fails. The automated operation of the system eliminates the need for manual intervention, which prevents a time lapse that could cause product spoilage. Diesel generators typically serve as a reliable power source for both units. As a chemical manufacturer or supplier, a dual redundant system can have a huge impact on the success of your business. You will experience a reduction in spoiled or damaged product that could hinder your ability to retain customers and grow your operation. Using dual reefers are also an important loss prevention step. You will dramatically reduce the costs associated with having to take back and dispose of spoiled chemicals. At a time where businesses must find ways to reduce expenses to remain competitive, a dual redundant refrigeration unit can bolster your cost containment efforts and have a positive impact on your company’s bottom line. 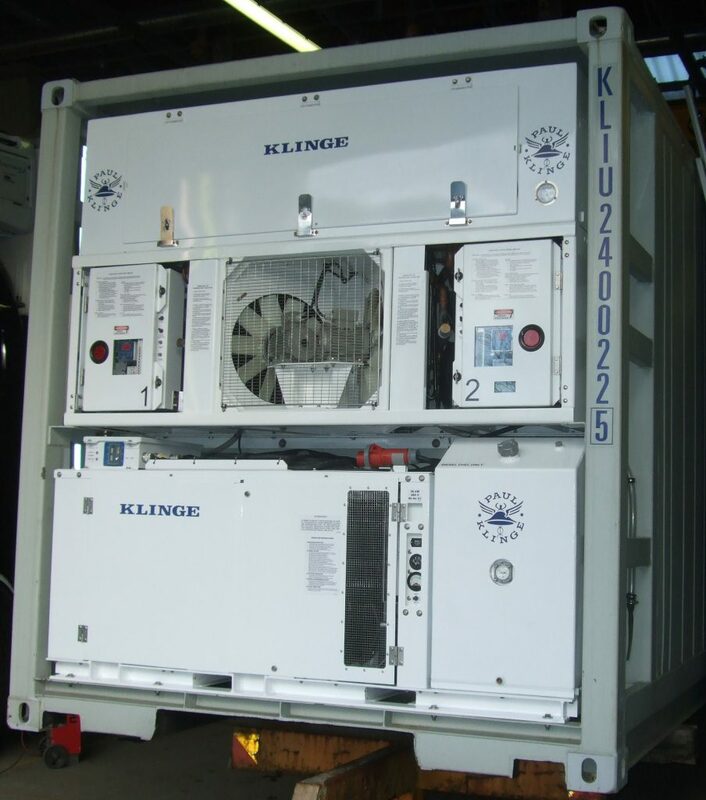 Klinge’s Dual Refrigerated Container has two full capacity reefer units. The dual refrigeration system, Model NMR-262, automatically switches to its back-up in an emergency to provide the ultimate peace of mind when shipping hazardous cargo or valuable cargo. The system complies with the International Maritime Organization’s regulations for transporting certain Dangerous Goods. It is used for products between 8ºC (46ºF) and -25ºC (-13ºF). The Dual Refrigerated Container is available with a diesel generator set, Model NMG-115, to ensure complete and independent protection of the cargo. The self-powered generator set powers the refrigeration units in case of loss of external power supply or during transport on a truck. 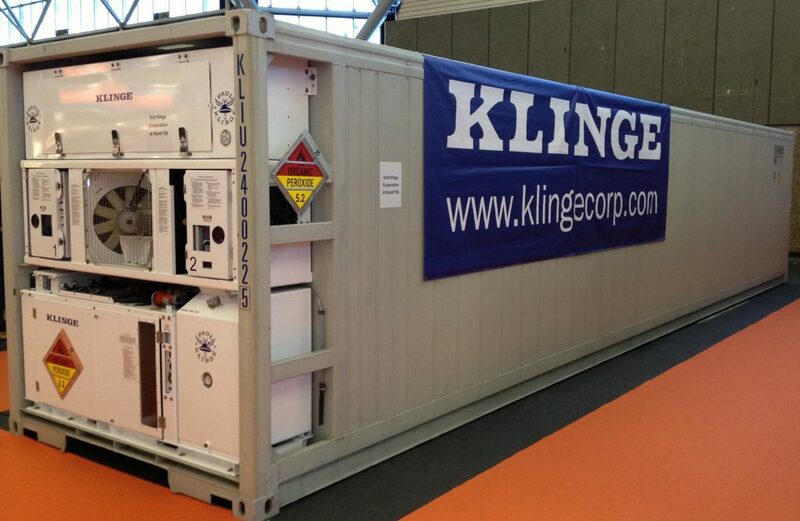 Klinge’s line of Dual Refrigerated Containers are used to transport hazardous chemicals, resins, adhesives, pharmaceuticals, ammunition and other goods requiring extra protection. No matter what type of cargo you ship, you can have confidence that you’ll be able to keep it at the proper temperature throughout its journey. Klinge has been providing this model to major chemical and pharmaceutical companies around the world for over 30 years. Contact a Klinge Group Specialist Today!